I’m excited to partner with family ecotourism experts Greenloons on a fun new Facebook campaign beginning today, March 4, 2014. Each month, for the next six months, the Greenloons Facebook page will offer one of my photographs as a free, downloadable screensaver. Additionally, you’ll discover the story behind each photograph and learn more about the part of the world where it was taken. 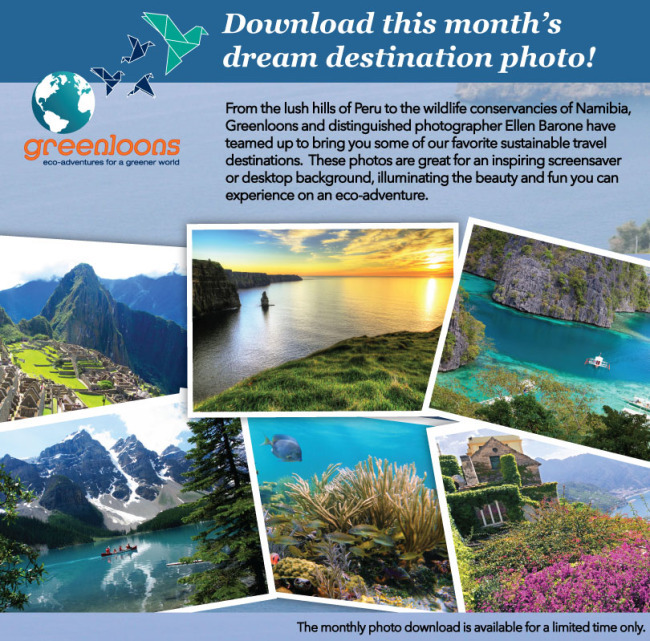 Greenloons is committed to providing trusted, transparent information about authentic, responsible, sustainable and certified ecotourism travel vacations available around the world. They connect travelers with meaningful, unique and awesome travel experiences by working with eco-certified guiding companies and sustainable tourism accommodation owners that have been independently verified as focusing on the triple bottom line of economic viability, social empowerment, and environmental responsibility. Learn more at Greenloons.com.